The Mahabharata (Sanskrit: Big Epos of the Bharata Dynastie) is beside the Ramayana the most popular epos of india. After the common youth the Kauravas and the Pandavas split up. Later they meet in Kurukshetra as opposing armies. Krishna stands here as leader of Arjuna in the center. The Texts is divided into 18 books(parvas). Chapters 25-42 of Book 6 Bhishma Parva contain the Bhagavad Gita. 1 Adi Parva (The Book of the Beginning) 1–19 How the Mahābhārata came to be narrated by Sauti to the assembled rishis at Naimisharanya, after having been recited at the sarpasattra of Janamejaya by Vaishampayana at Takṣaśilā. The history and genealogy of the Bharata and Bhrigu races is recalled, as is the birth and early life of the Kuru princes (adi means first). The twelve years of exile in the forest (aranya) : They are an allegory of step 7 and 8 of the universal path. 12 Shanti Parva (The Book of Peace) 86–88 The crowning of Yudhishthira as king of Hastinapura, and instructions from Bhishma for the newly anointed king on society, economics and politics. 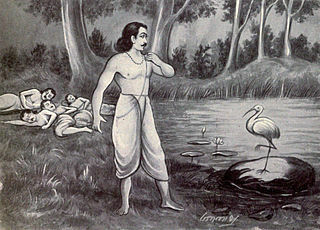 The Mahabharata contains the life of the Pandavas as a parable of the path. The Pandavas represent the 5 Elements. They grow up together with the Kauravas and leave Drupadas court together with their common wife Draupadi at the end of step 6. Draupadi was the fire-born daughter of Drupada. She represents the fiery Kula-Kundalini. Arjuna was able to win her by mastering the bow which Agni gave him, comparable to Rama in the Ramayana, who won Sita because he was able to strech Shivas bow. The later battle of Kurukshetra happens during the phase 18.2.